The road out of Jericho was always well-traveled, but Bartimaeus could sense something different in the air. Just as the angle of the hot sun on the back of his neck told him the time of day, the buzz of the crowd, the whispered excitement, and the press of bodies told him the truth that his ruined eyes could not — something was stirring. Slowly, he pieced together the scene: a Healer, a Miracle Worker named Jesus was heading his way, and the word on the street . . .? This Teacher just might be the promised Messiah. “Jesus, Son of David, have mercy on me!” he howled. “Pipe down, Bartimaeus,” hissed the embarrassed townspeople, but the blind beggar called out all the louder. In this encounter of a life time, Bartimaeus put all that he knew about Jesus into his heart’s cry, for he had a huge and impossible dream. Bartimaeus wanted to see, and he boldly broadcast his deep and urgent need to the only One in the universe who could help him. Saying our dreams out loud can be intimidating — even frightening. Whether it’s a career goal, a longing for intimacy, a desire for a child, or an avenue of service to God that won’t stop calling our name, it’s easy to allow the sheer size of the dream to muzzle our cry for help and to overwhelm us with fear. As a young woman, I believed that God was calling me to teach the Bible, and so I volunteered for a summer ministry that landed me in front of a crowd of rowdy kids with nothing in my trembling hands but my Bible and a few flash cards. Thinking that preparation — knowing my material inside out – would chase away the terror, I studied hard with a pounding heart. I will uphold you with My righteous right hand. That young woman who hid behind her long hair and struggled to make eye contact with the world still finds her way back into my head sometimes. When I’m standing at a microphone, or preparing to click on “publish,” or leading a stressful meeting, I’m tempted to be still, to shut down, and to believe the lie that my words don’t matter — that I am, somehow, unqualified. Would you rather give in to the fear and miss this opportunity? In the light of this blazing truth, may we answer God’s omnipotence with a trust that cries out, fearless. By grace, may we let our fear drive us to the One who casts out all fear. If you enjoy reading Living Our Days, subscribe to get regular content delivered to your inbox. Just enter your e-mail address in the field at the top of this page. I link-up with a number of blogging communities on a regular basis. They are listed in the left sidebar by day of the week. I hope that you will take a moment to enjoy reading the work of some of these fine writers and thinkers. Raise Your Voice: Why We Stay Silent and How to Speak Up by Kathy Khang is challenging me to look carefully at the way I use my words, lending the realization that even my choice to be silent communicates something. Apathy, insecurity, or laziness are not traits I want to “give voice” to, so I’m trusting for courage to lean into a gracious and yet more vocal role in the communities I inhabit. Khang shares her own legacy of silence, struggling with her role as an immigrant from South Korea, feeling voiceless, learning to raise her voice “doing the good work of the good news,” while struggling with credibility and suffering from imposter syndrome. Challenges arising from her experience as a woman of color in a leadership role in para-church ministry drove her deeply into the Word of God for assurance from biblical role models like Esther and Moses. Beloved and known by our Creator, we are called, at times, to speak gritty truth to one another, not to hurt or tear down, but to bless and to influence for good. Who Am I? What unique perspectives do I bring to the table as a white, middle-aged, long-time-married mother of sons with plenty of time in a pew? Who else is sitting around the same table with me? What can we learn from each other? What is in My Wheelhouse? The downward draw of imposter syndrome has muzzled me more than once in situations where I probably had the most experience in the room, but was too intimidated to speak up–even though I saw the conversation going in a direction that looked ominous to me. The lesson here? Any combination of gifting and experience that God has graciously given comes with a responsibility to speak up. Am I Willing to Fail or Be Judged? Quite honestly, his is huge for me, but most of the time, I am probably much safer than I imagine. Kathy points out that testing my voice is a matter of humility. I don’t need to “toughen up, become immune, or be unmoved by criticism or failure.” (59) I just need to be willing to learn from it. What Are My Unique Gifts, Talents, and Skills? Good stewardship demands that I put myself in the way of risk to be available for God’s agenda. Who Are My People? Who needs my encouragement? Whom has God already put within my circle of influence? What Diverse Voices Am I Learning From? Reading, listening, paying attention to people whose faces and stories are radically different from my own has been life changing. Raise Your Voice sat in a pile beside my bed for months before I made the commitment to read it, because I knew the author would call me out of my comfort zone. A word to the wise: sometimes the journey into discomfort is easier in community. If you’re looking for a challenge, The Red Couch Book Club is reading Kathy’s book this month. How Do You Care for Yourself? Self care can be as simple as going to bed at a reasonable time, eating healthfully and mindfully, or saying no to unreasonable demands. If my voice is shrill from exhaustion or unreasonable because of poor preparation, the message God has given to me may not be conveyed in the best possible way. There’s plenty of work in these seven questions to last me well into the new year, and I’m wondering if you also are feeling the tug to raise your voice in profound and courageous words. It can be a fearsome thing to be visible in the world by becoming uncomfortably audible. God invites us to inhabit our vulnerability by faith, a sinewy confidence in a sovereign God that trusts in His placement of our voices, cherishes His assignment of our customized message, and leaves the outcome in His powerful hands. Many thanks to InterVarsity Press for providing a copy of this book to facilitate my review, which, of course, is offered freely and with honesty. I am a participant in the Amazon Services LLC Associates Program, an affiliate advertising program designed to provide a means for sites to earn advertising fees by sharing products and linking to Amazon.com. If you should decide to purchase Raise Your Voice: Why We Stay Silent and How to Speak Up simply click on the title here or within the text, and you’ll be taken directly to Amazon. If you decide to buy, I’ll make a small commission at no extra cost to you. Smiling as I read Scripture, it’s clear to me that I’m not the first God-follower to plead inadequacy in the midst of an assignment. Moses famously “reminded” God that he had never been granted the gift of gab. Jeremiah waved his birth certificate under God’s nose, as if the One who had formed him, chosen him, and assigned him to a prophetic ministry might have confused His young servant with a much older, more experienced servant of the same name. In the moment, saying yes to God can feel risky. The outcome of obedience is hidden from view, for the following life is like a film that we experience one frame at a time. My fiery and faith-filled yes at the outset may lead to blessing and fruitful outcomes; there may be Red Sea crossings and miraculous provisions of nourishing bread and refreshing water at just the right time. Or — my assignment may be more like Jeremiah’s. Who in her right mind is eager to embrace a call to “pull up and tear down,” to “tear apart and demolish,” and then, after the dust has settled, to “build and to plant?” (Jeremiah 1:10) Certainly not Jeremiah, but it’s interesting to note that God did not respond to Jeremiah’s anxiety with a slap on the back and a “You’ve got this, my boy” pep talk. Instead, he gently turned Jeremiah’s anxious eyes away from his own inexperience and toward a greater reality . . . 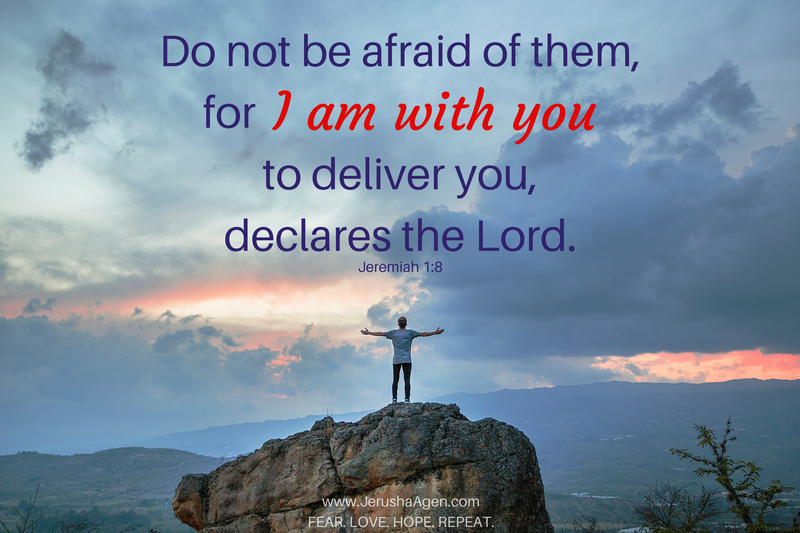 When Jerusha Agen invited me to join her at the Fear Warrior Blog, I had just begun reading about Jeremiah: his youthful lack of confidence, his impossible assignment, and then the way God met Him there and bent over backwards to communicate His promises of strong support and supernatural strength. Who better to lead us into warrior mode in our continual assignment to fight against fear in our ordinary lives? If you enjoy reading Living Our Days, subscribe to get regular Bible studies and book reviews delivered to your inbox. Just enter your e-mail address in the field at the top of this page. The road out of Jericho was always well-traveled, but Bartimaeus could sense something different in the air. Just as the angle of the hot sun on the back of his neck told him the time of day, the buzz of the crowd, the whispered excitement, and the press of bodies told him what his ruined eyes could not — something was stirring. Saying a dream out loud can be intimidating — even frightening. ld love it if you would join me today over at God-sized Dreams, an on-line community where you can say your dream out loud and find the glorious encouragement of others who are also familiar with the joys and pitfalls inherent to dreaming. While you are over there finishing my story about the power of Truth to cast out fear, I hope you’ll meander around the site and be encouraged by others who have set sail on the journey toward their own God-sized dreams. If you enjoy reading Living Our Days, subscribe to get regular Bible studies and book reviews delivered to your inbox. Just enter your e-mail address in the box at the top of this page. Whether it’s feelings of inadequacy, parenting anxieties, or panic over the latest terrorist tactics in the news, the challenge to face down our fears and to move forward into new, healthful, and bold behaviors is a common thread for January writing and thinking. The problem, however, with this seasonal booster is that the need for courage doesn’t expire on February 1. Fear Fighting is a year-round calling and Kelly Balarie is a natural born cheerleader, committed to awakening courage in her readers. She has earned some pretty impressive credentials as a fear fighter in her battles with an eating disorder, depression, financial stresses, and family tragedies. She has learned, first hand, that transformation is an act of God that takes place in the present tense. With a raised fist, she trumpets the invitation to be a modern-day Deborah, the fiery woman from the time of the Old Testament Judges who dared to ask questions, listened for God’s answers, ejected the enemy’s lies, timed her move, and then acted in confident belief without fear — because she knew where she was going. If it woos with the voice of love, it is God. If it calls you closer to God, it is God. If it speaks truth, it is God. If it wants to beat you, tie you, and throw you out back for always being despicable, it is not God. “Fear not, for I am with you; be not dismayed, for I am your God; I will strengthen you, I will help you, I will uphold you with my righteous right hand,” Isaiah 41:10. In these early days of 2017, it’s a great time to admit to the reality of fears that whisper words of condemnation and failure and to accept the help of others, to learn from their stories, and, most crucially, to enter into the transforming Truth of God’s Word. Join me here on Thursday for week one of a book discussion group on C.S. 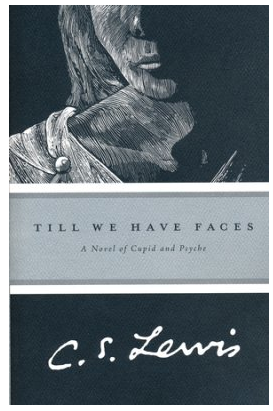 Lewis’s novel, Till We Have Faces. The darkness, guided by your hand. In a sense, everyone steps into the darkness of the unknown at the beginning of a new year, and the more people we love, the more vulnerable we seem to be. We can’t control the choices of others; we can’t foresee the twistings and turnings of the details of our days, of our employment situation, of our health; we can’t shield our loved ones from the forces of nature or the consequences of their actions. Although Elisabeth was a young woman when she penned these words, she had already grasped an important truth that thrums through my bones at the beginning of every year: we are walking into the unknown, but even so, we can rest in the knowledge – the deep and abiding confidence – that God wants to guide us, and the unknown is well-known to Him. “Where then does wisdom come from, and where is the source of understanding? God understands the way to it; He alone knows its source; For He can see to the ends of the earth, and He surveys everything under heaven,” Job 28:20, 23, 24 (NEB). God, in His wisdom, wants to guide us far more than we want to follow! He doesn’t simply e-mail a set of directions to us or give us advice from a distance. He has promised to be a Guide. I am writing from a place of struggle and questioning at the end of a year that has seen more question marks than exclamation points, more misty fog than lighthouses, and many days in which I wondered if I had taken a wrong turn somewhere. To be honest, when I have a decision to make, I want sky writing. When it’s time to buy a car, I want to see, “Buy the blue Ford,” hanging in the heavens. Notice, however, that whenever supernatural guidance was given in the Bible (pillars of cloud and fire, talking donkeys, angels, dreams, and visions), it was not usually asked for, but came at God’s discretion. He is free to communicate by whatever means He chooses. With this in mind, I want to read His promises of guidance with confidence and to sense His leading, to trust His working in my life by His Spirit to guide my steps and — perhaps even more important — to set me on the right path when I make a wrong turn. Providing a list of “tried and true methods for finding the will of God” or prescribing how God will work in a life is presumptuous – and harmful. Our God is in the heavens, and He does whatever He pleases. However, an understanding of how God has worked in the past is helpful in discerning how He may work in the future. The truth is that much of what God requires of us involves lots of “mundane faithfulness” to daily tasks. David’s harp playing skills that gave him an audience with King Saul were gained in a field watching sheep. Samuel faithfully served in the temple, and I’m sure that Matthew had no idea that he would be called to the life of a disciple on the last day of his tenure as a tax collector. And make it plain on tablets. That he may run who reads it. But at the end it will speak and it will not lie. Waiting is the hardest assignment of all in the discernment of God’s will. Even Ruth, in all her faithfulness and obedience felt the weight of it and received this counsel from Naomi: “Sit still, my daughter, until you know how the matter will fall,” Ruth 3:18. We are subject to authority and, indeed, obligated to serve and to be sensitive to one another in the body of Christ. Fulfillment of my responsibilities to the people God has placed in my life has often served as a beacon by which God has guided me. For example, should I accept a speaking engagement that conflicts with an important meeting with the ladies of my own church? Probably not. A word from an employer, a co-worker, a sibling, a parent, or a friend may be used to influence and guide us. When seeking guidance on a matter, it is wise to take godly counsel and to pray with a sister in Christ, “for where two or three are gathered together in My name, I am there in the midst of them,” Matthew 18:20. It is no accident that every Christian possesses a particular palette of abilities and spiritual gifts. Countless times, I have heard my husband counsel our boys, “Whatever you have in your hand, God will use,” and that’s not a thought that’s original with him. God said the same thing to Moses about a simple rod. It gets tricky here because we are fallen creatures, barely knowing our own motives, but desires placed prayerfully before God can be a trustworthy guide. The prayer life of the Apostle Paul demonstrates his conviction that it was best to submit his yearnings to God, for even a longing to visit Rome for the establishment of the believers there was made subject to God’s approval. There was nothing glamorous about the circumstances surrounding Saul being anointed King over Israel. Remember? He was in a predicament because his Father’s donkeys had wandered off. He was out looking them, but what he found instead was God’s servant Samuel who had explicit directives that Saul was to be God’s man on the throne. Our circumstances are part of the “all things” that God promises to work for our good and his glory in Romans 8:28. Often we do not recognize the hand of God until in retrospect we look back on the events of our lives and see how He has led. “And your ears shall hear a word behind you, saying, ’This is the way, walk in it,’ when you turn to the right or when you turn to the left,” (Isaiah 30:21 ESV). This post first appeared at Soli Deo Gloria . Subscribe to get regular Bible studies and book reviews from Living Our Days delivered to your inbox. Just enter your e-mail address in the box at the top of this page.